This fun and easy felt crafts fringed felt heart takes some time and a few inexpensive materials to make an interesting decoration. You can make it simply as shown here, or add embellishments to your liking. 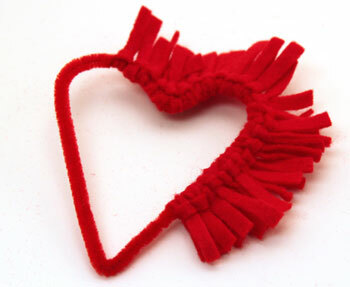 The fringed felt heart can be hung on a door knob, drawer pull, on a mirror or any where a simple yet attractive heart decoration can brighten someone's day. 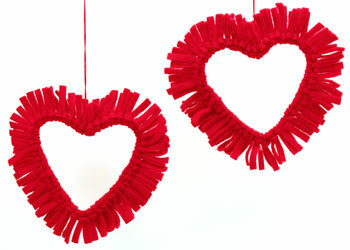 The fringed felt heart could also be interesting additions to a party - Valentine's, bridal shower, baby shower or other. This version was made with red for the upcoming Valentine's Day. But, choose the color you prefer for your fringed felt heart. Blue or pink would be pretty for a baby shower, white for a bridal shower. Or, use bright colors for a striking display. Cut strips of felt 3 inches long by 1/4 inch wide. You will need 50 to 60 pieces to cover the chenille wire. 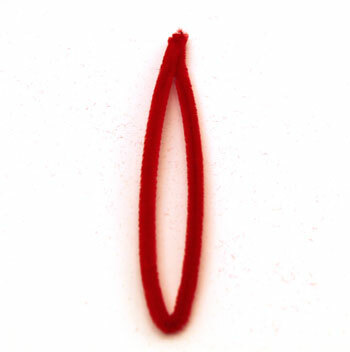 Fold the 12-inch chenille wire in half. Twist the wire ends together. 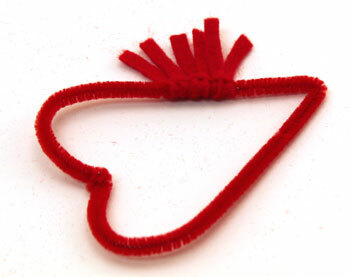 Fold the two end wires to lock them together and to prevent the ends from sticking your fingers as you work on the easy felt crafts fringed felt heart. Working carefully, bend the wire into the basic heart shape. Don't worry about a perfect shape at this point. Fold one of the felt strips in half. 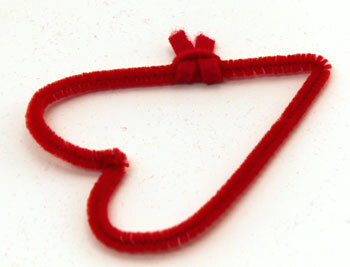 Place it under one side of the wire heart shape with the loop on the outside and the ends inside the heart. 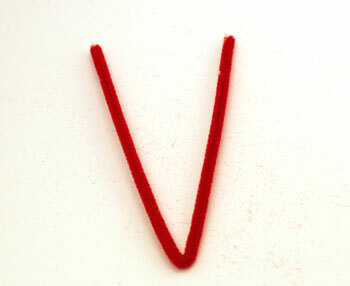 Wrap the two ends of the felt around the wire and put them through the felt loop. Pull the felt ends firmly through the loop to tighten the felt around the wire. Use the same process to add the next felt strips adjacent to the first one. As you work around the heart shape, keep the felt strips close together. Add the strips to cover the chenille wire completely. 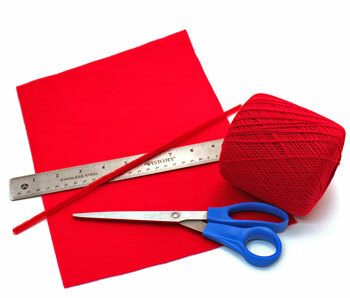 Depending on the thickness of the felt and how closely the strips are kept together, you may need more or less strips. 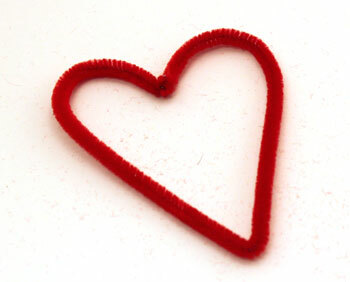 This easy felt crafts fringed felt heart used just over 50 strips of felt. After adding all of the felt strips, adjust the shape of the heart as needed. For hanging, cut a piece of yarn 8 to 10 inches long. This is #10 crochet yarn. Use the same process as used for the felt strips to add the yarn loop. Fold the yarn in half. 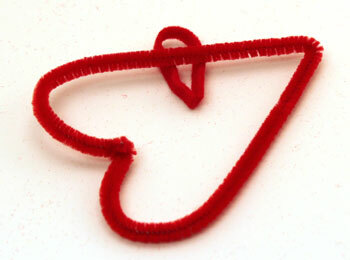 Place is under the fringed felt heart with the loop at the top and the ends inside the heart. Bring the ends up around the fringed felt heart and through the loop. Pull firmly to tighten the yarn around the heart. 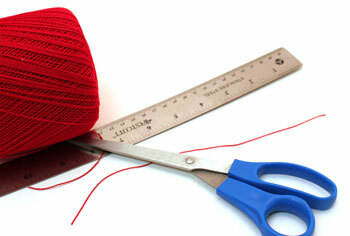 Tie a knot in the ends to complete the loop. 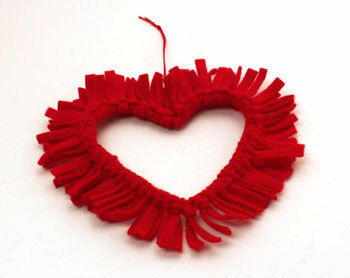 The easy felt crafts fringed felt heart can hang anywhere to brighten your or someone else's day. This next version was made using 16 inches of 18 gauge floral wire. This wire is stronger than the chenille. Needle nose pliers can be used to cut the wire and twist the ends together. The longer wire needed more felt strips - between 60 and 70. 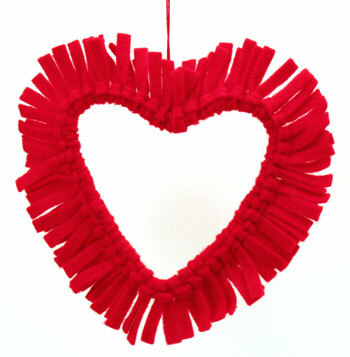 Also, the message from a child's Valentine card was cut out and hung using yarn in the middle of the fringed felt heart. 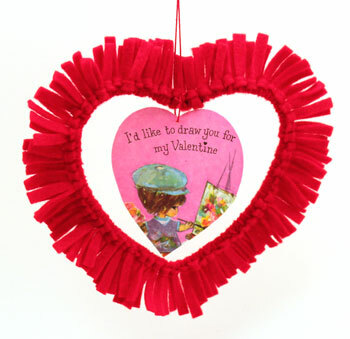 You could cut hearts from decorative paper or add other embellishments to hang in the middle of the heart. 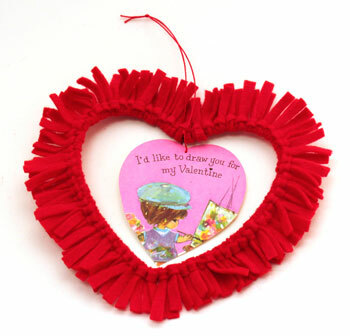 Here, this version of the easy felt crafts fringed felt heart hangs with its simple Valentine message. This same process can be used to make a larger version for a door wreath. 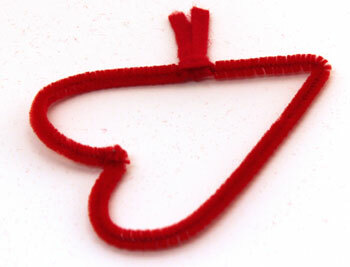 Use a heavier gauge wire - perhaps a wire coat hanger - to form the heart-shaped wire. 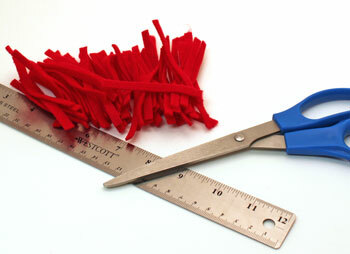 Cut the felt strips wider and longer, for example, 6 inches by 1/2 inch, for the larger wreath size. 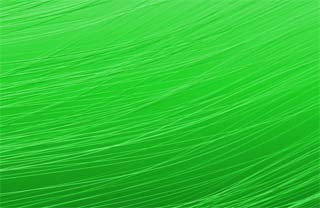 Have fun making your own versions with your own creative additions. The fringed felt heart would be a great project for children to work on after an adult helped them with the initial steps. 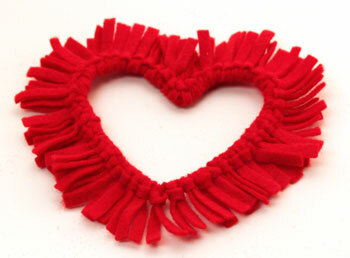 This easy felt crafts fringed felt heart project takes some time but uses simple and inexpensive materials and tools.